Bible Alone? Not for the Fathers! I just came across this quotation again. What a great reminder of the authority of the Church and the Apostolic Tradition! How did I fall for sola Scriptura back in my old life? The Church preserves many beliefs and practices that generally are accepted or publicly commanded. Some are taken from written teaching; others have been passed on to us “in a mystery” by the tradition of the apostles. In relation to true religion, both of these have the same force. Finished Apostolic Fathers Documentary – Whew! After two years of work and deadlines, we are now FINISHED! We watched the final version last night for the first time. Wow! We are VERY happy with the results and think it might be our best Footprints of God DVD yet. Now it goes to replication, captioning, printing, packaging, etc. It will be out in stores — and on my website — no later than October 1. Now we start working on Abraham: Father of Faith & Works. One of our pleasures we enjoy no matter where we go is looking for new birds, learning their calls and songs, and studying their habits. No matter where we go there are birds. It has been my hobby as long as I can remember and Janet jumped right in too. Our kids were never too interested but our grandkids love to watch birds with us — even to sit and look at their pictures in our many bird books. For anyone else interested, you can see my list of birds we've seen recently, along with a few other critters. You can see our list here. For my article on Bird Watching and God, click here. For my article on Turkey Vultures and the Bible, click here. 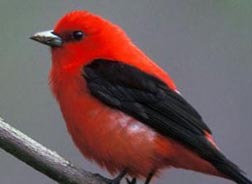 By the way, the picture here is of a Scarlet Tanager. His song sounds very much like a robin with sore, raspy throat. He woke us up every morning Up North last week, but we didn't care. We enjoyed listening to him praising God from the tree tops. You can hear his song here.